The exact cause of Alzheimer's disease isn't known, although some risk factors are known. The risk of developing the disease increases with age, for example. There's a higher risk of Alzheimer's if a family member has the disease. However, inherited genetic factors are responsible in only a small number of families. When the disease is inherited, it tends to lead to early onset of Alzheimer's, usually between the ages of 35 and 60. One of several different genes may be at fault, such as the presenilin-1 gene on chromosome 14 or the amyloid precursor protein gene on chromosome 21. 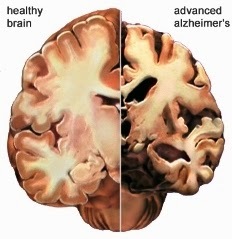 Most cases of Alzheimer's develop later in life and the genetic link is weaker. The genes at fault here are those for apolipoprotein E. Problems with these genes increase the risk of disease but don't make it certain - other factors are involved. Scientists believe other problematic genes may be located on chromosomes 9, 10 and 12. Clearly, it's a complicated situation with much yet to be explained. There's no cure for Alzheimer's disease, but drugs are available that may specifically slow the loss of mental function in mild to moderate cases. These include the acetylcholinesterase inhibitors such as donepezil, rivastigmine and galantamine, which improve brain cell communication, and memantine, a glutamate blocker which protects brain cells against damage. Other drugs such as aspirin and the cholesterol lowering treatments such as statins may be of use in slowing the vascular damage that may also play a role in many types of dementia including Alzheimers. Anti-psychotic drugs are used to try to control behaviour in more severe dementia but their use has been criticised by many as a poor substitute for more expensive and time consuming management plans including counselling, psychotherapy and one to one nursing care. There's some evidence the herb ginkgo biloba and possibly also vitamin E may help delay progression of the disease, too, but further research is required. Treatment can be given for symptoms such as depression. Techniques to aid memory, such as writing lists or reminders, can be helpful in the early stages. Support and help can be provided by social services for those with Alzheimer's disease and their carers, but full-time residential care may be necessary in the later stages of the disease. Tests to identify those in the early stages of Alzheimer's disease are in development. The same risk factors for heart disease are believed to increase the risk of Alzheimer's. So although there's no definitive way to prevent the disease, not smoking, keeping blood pressure and cholesterol at healthy levels, taking regular exercise, maintaining a healthy weight and eating a healthy diet rich in the antioxidant vitamins C and E and oily fish are all sensible. Some research has suggested that taking non-steroidal anti-inflammatory drugs (NSAIDs) or cholesterol-lowering statin drugs may lessen the risk of Alzheimer's disease, but this research continues. Other research into brain stem cell therapy, antioxidant therapy and a vaccination to prevent build up of plaques on the brain is also ongoing.